As the start of the school year approaches, educators are busy preparing for a great year. As learners, many of us will approach the new year with excitement and optimism after reflecting on our own teaching during our time away from the classroom. Those of us who sport a growth mindset typically start each school year with the intention of being better. We have collected new ideas, thoughtfully considered how to implement them, and we are excited to make a difference in the lives and education of our students. I truly believe that all educators should consider blogging as a tool for learning and this seems like the perfect opportunity to once again try to encourage all educators to blog! Blogging provides students with authentic opportunities to improve writing, engage in research, read more and personally connect with their own learning through thoughtful reflection. If that’s not enough, please consider these ideas. Blogs offer an exciting way for students to engage in real-world writing. Blogs give students a voice and an audience. Students write better and put more thought into the revision process when they are publishing for an audience. Blogs allow for feedback through comments which can be very motivating. Blogging requires students to engage in everyday research and dig deeper to construct knowledge through the synthesis of ideas. Blogging provides students with opportunities to connect with their own learning by remixing content, developing new ideas, and thoughtfully reflecting. Student blogs provide parents with a convenient and personalized opportunity to connect with their children’s learning experiences. When you are ready to share your blog with the world, use Twitter and other social media platforms to connect with educators and build your PLN. 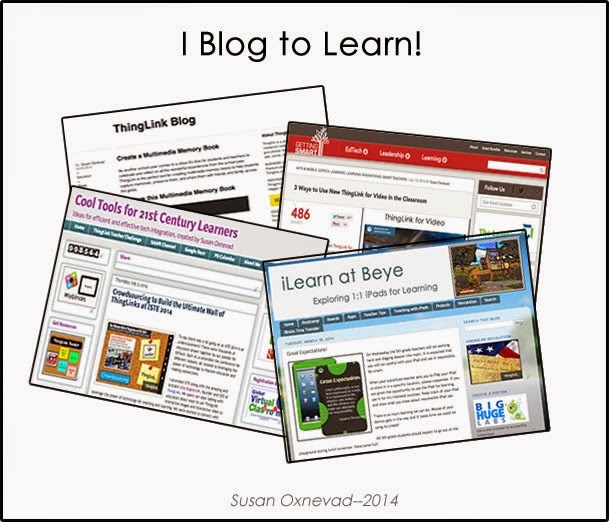 Share your blog with your students and provide them with opportunities to blog.